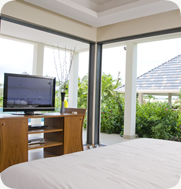 This bedroom has a double aspect of the pool and the gardens. Open both doors and take in the glorious views and scents. Modern and contemporary with super king-size bed, 32-inch TV and DVD player, air conditioning, fan and mood lighting, this is a very desirable room. Bespoke custom-made teak fitted wardrobes and dressing area give you all you need. A door leads through to the large and spacious bathroom which includes double basins, rain shower, toilet and masses of storage.